The totally redesigned 2019 Volkswagen Jetta offers something for every driver, from Newport News, VA to Elizabeth City, NC. With standard Volkswagen Car-Net® App-Connect, the new Jetta keeps everyone connected Apple CarPlay™ and Android Auto™. These high-demand features provide an easy way to manage your contacts and access your favorite smartphone apps, such as iHeartRadio™, Pandora® and Google Maps™. Drivers also benefit from standard Bluetooth® technology, a USB port and a 6.5-inch Composition Color touchscreen. Navigation, music streaming and connectivity is always along for the ride in the new 2019 Volkswagen Jetta. Schedule a test drive today at Southern Greenbrier Volkswagen, serving Chesapeake, Norfolk, Portsmouth, Newport News and surrounding areas. To ensure an exhilarating ride for every driver, the 2019 Volkswagen Jetta comes standard with a 1.4L TSI® in-line 4-cylinder turbocharged engine. Behind 147 horsepower, the all-new sedan provides thrills at every turn while achieving an impressive EPA-estimated 40 highway MPG. Just because every Jetta provides the same brilliant performance, that doesn't mean they're the same. Showcase your personality by choosing from 5 trims (S, SE, R-Line, SEL and SEL Premium) in 9 vivid colors, including Deep Black Pearl Metallic and Habanero Orange Metallic. Find the right sedan for you. 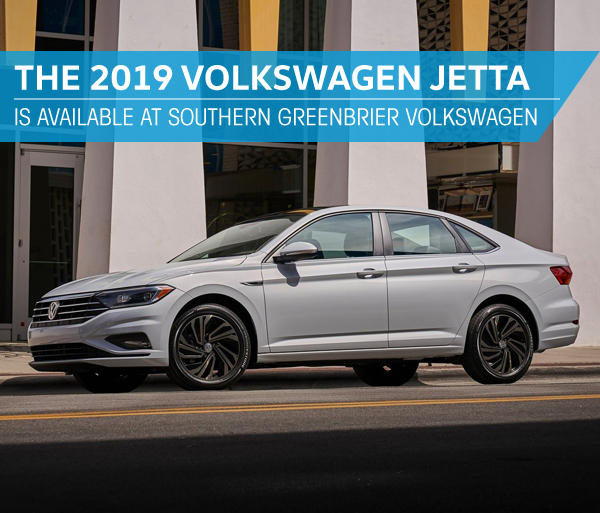 Test-drive a new 2019 Volkswagen Jetta at Southern Greenbrier Volkswagen. The new 2019 Volkswagen doesn't just look great. It does a great job looking out for you. The all-new Jetta also provides a STANDARD rearview camera system, an Intelligent Crash Response System, plus various active and passive safety features. Visit Southern Greenbrier Volkswagen today and get cutting-edge safety in the 2019 Volkswagen Jetta. When you drive away in a new 2019 Volkswagen Jetta you also leave with America's best bumper-to-bumper limited warranty. With the People First Warranty, you'll receive bumper-to-bumper limited coverage for 6 years/72,000 miles. That's twice the limited covered offered by the 2018 Ford Focus, Chevrolet Cruze and Toyota Corolla. Not even the 2018 Hyundai Elantra or Kia Forte can compete with Volkswagen's generous warranty. For a worry-free way to ride around the Virginia Beach area, drive the new 2019 Volkswagen Jetta. Visit Southern Greenbrier Volkswagen in Chesapeake, serving Virginia Beach, Norfolk, Portsmouth, Newport News, VA and Elizabeth City, NC.